Our family visited South Beach Miami as a pre stay before our charter flight to Cuba. We spent a couple of days taking in all the color of South Beach, based at the Blue Moon (a Marriott boutique hotel) located on Collins Ave, we were able to explore South Beach, South Point Park, Espanola Way and the Lincoln Road Pedestrian Mall. Our first stop on the evening we arrived was Joe's Stone Crab. I remember going there and gorging on crab legs during a business trip more than 20 years ago. Not much has changed since...the restaurant still offers excellent seafood in an elegant environment. Those platters of stone crabs aren't cheap, (I'm kind of sorry I couldn't put them on an expense account!) but they are delicious and the service is top notch! 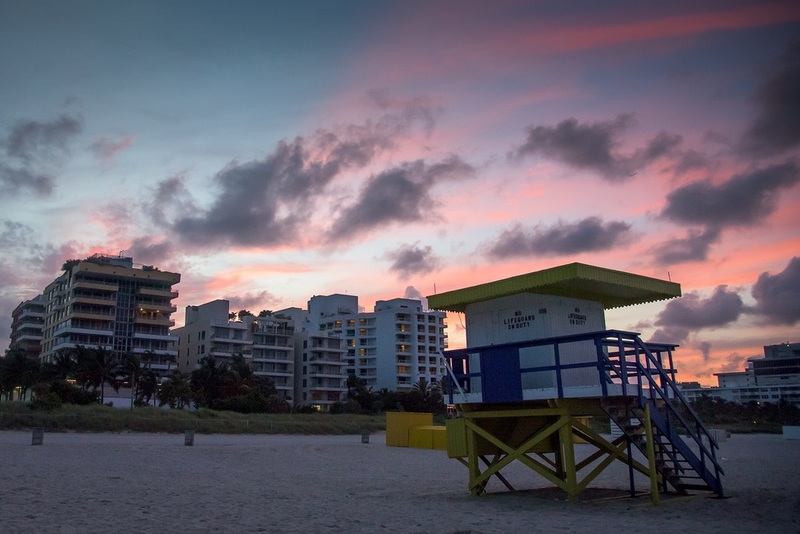 As evening rolled around, not only was the sunset colorful, but South Beach in the evening got even more colorful! We started our walk at South Point Park on Biscayne Bay, and made our way up South Beach. 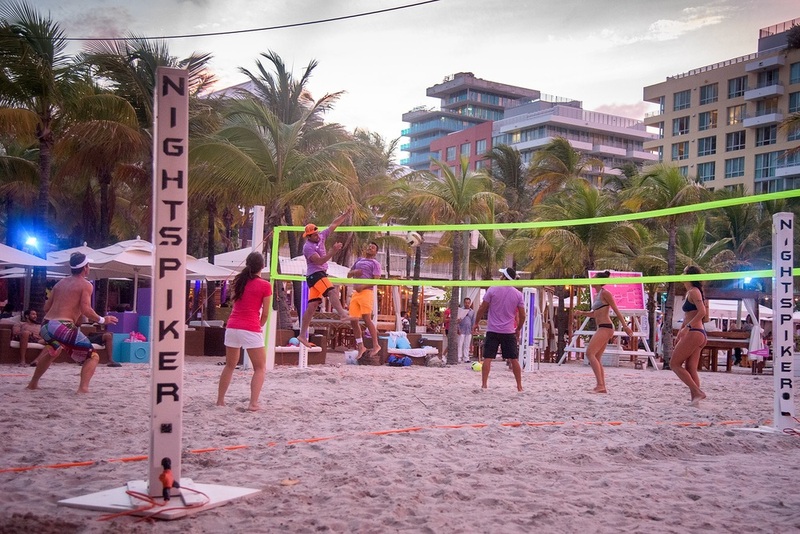 Sunday night beach volleyball at courts by South Beach amped up with lights and music and a bar! 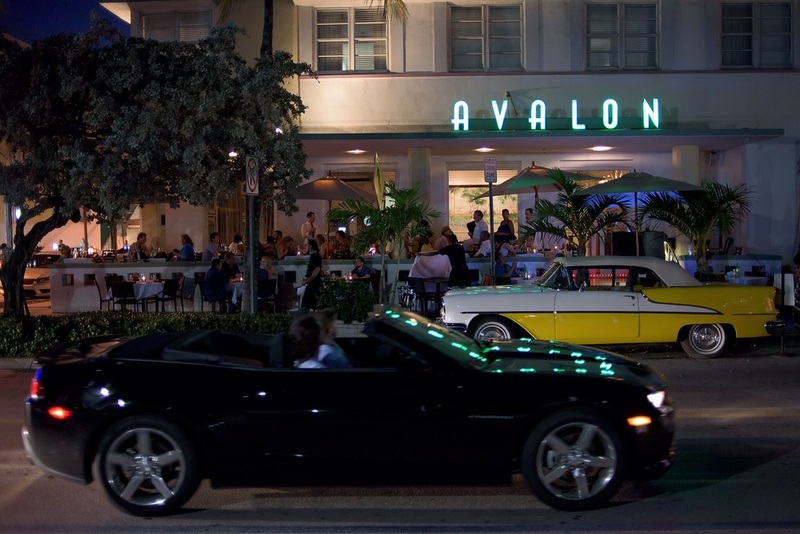 Ocean Drive is the "main" drag in South Beach, a colorful place day or night! Ocean Ave is a scene for people with fancy cars to show off their "rides" by looping around Collins and Ocean Ave all night. Plenty of colorful neon decorates the Art Deco buildings in South Beach. The next day, we had a swim on the beach before seeking advice from our concierge at Blur Moon about a good place to get pizza for lunch. He recommended Pizza Rustica, a little take out and delivery place on Washington Ave.
Pizza Rustica is a just a store front with a broiling hot pizza oven and a counter top inside or some umbrella tables outside, but the pizza is deliciouso! It was hot in South Beach in mid June, but no place could be hotter than right here! These are called "huge squares" and cost $3.50- $5.75 for one depending on the toppings. In addition to being one of the best lunch values in town, this is truth in advertising! Another fun colorful stop for art fans or design geeks is the Wolfsonian (link). There are also some really interesting and colorful historical propaganda posters collected from all over the world that appealed to the history buffs in our family! 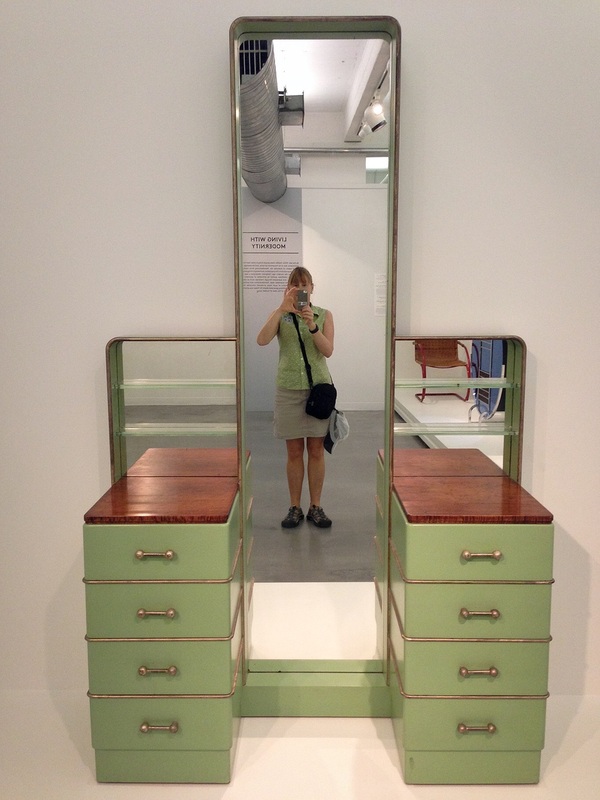 Our design geek loved the displays of Art Deco items. Here is an interesting and colorful metal Art Deco style vanity, which I happened to colorfully matched that day! Another area to visit is Espanola Way on Washington. This area has some pricey sidewalk cafes and more reasonably priced boutiques. It's a nice quiet and shady area in the heart of the city. Espanola Way has examples of Mediterranean architecture. Well...this shop isn't very colorful! Here's a shop that is very colorful, and the clerk was super friendly. A little further up from Espanola Way is the Lincoln Road Pedestrian Mall. 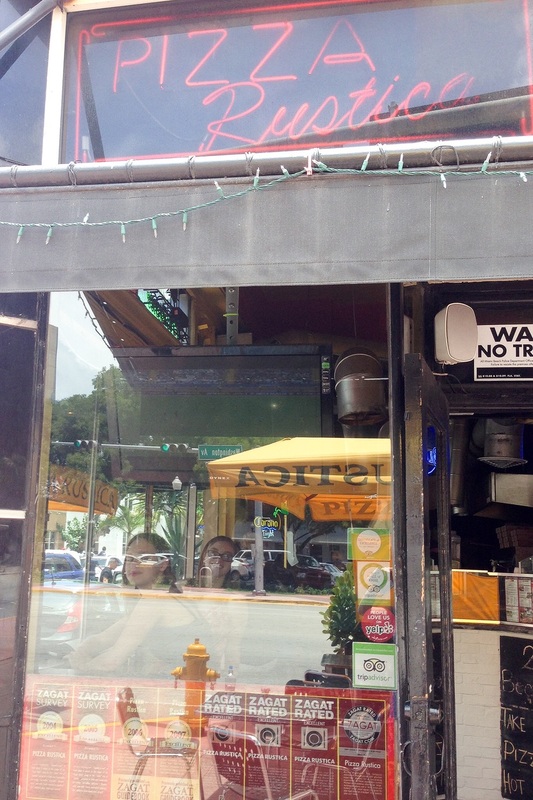 In addition to all the usual chain mall stores, there are independent stores and lots of sidewalk cafe restaurants lining both sides of Lincoln Rd. 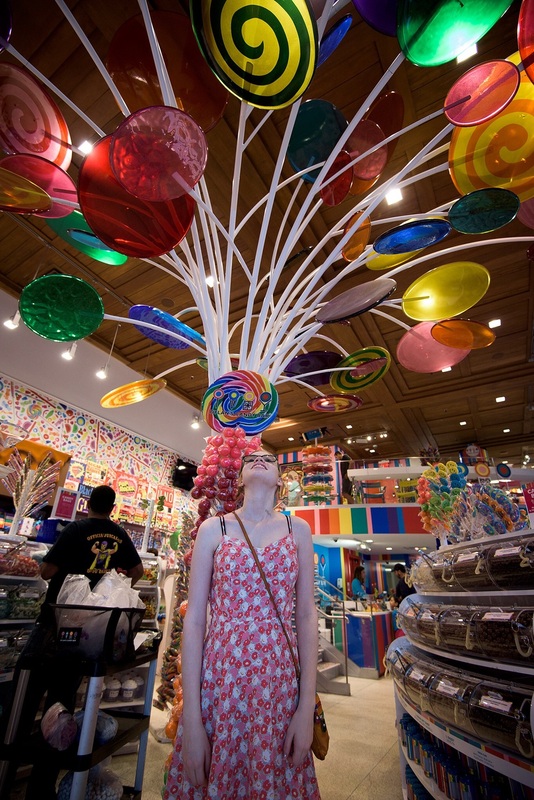 Dylan's Candy Bar is a very colorful shop for kids and kids at heart! The man made shops and cafes are not the only colorful thing on Lincoln Road, this little gecko was showing off his colors trying to attract a mate on a tree right next to our table at Locanda Sabilla. 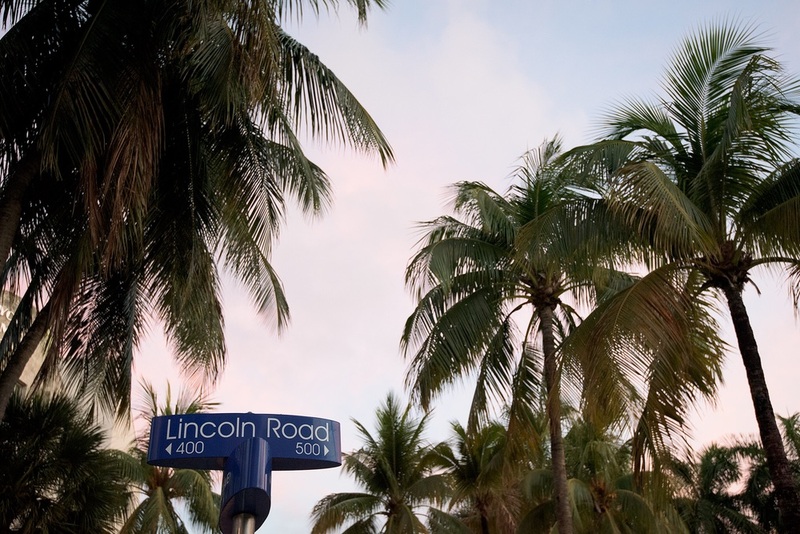 South Beach is very easy to navigate, with a grid of numbered streets intersecting all the main tourist thoroughfares; Ocean, Collins and Washington. It's easy to walk the whole area of you don't mind putting in a few miles. Traffic is almost always thick, and parking tight, so we found it easier to walk and could calculate how long our walk would be based on street the street address to our next stop. If it's just too hot to walk, (or your heels are too high) once there, there is a tourist bus that runs for a nominal fee and stops at all the major areas. After a day walking around hot and colorful South Beach, there is nothing better than slipping into a colorful, cool pool! The pool at Blue Moon on Collins Ave.